WE’VE all been there in some way or another. Part of learning the art of cooking means creating and recreating flops and fails until we get it right. Sometimes, though, these flops can be potentially disastrous. For example, did you know that you should never pour water into a burning pan? 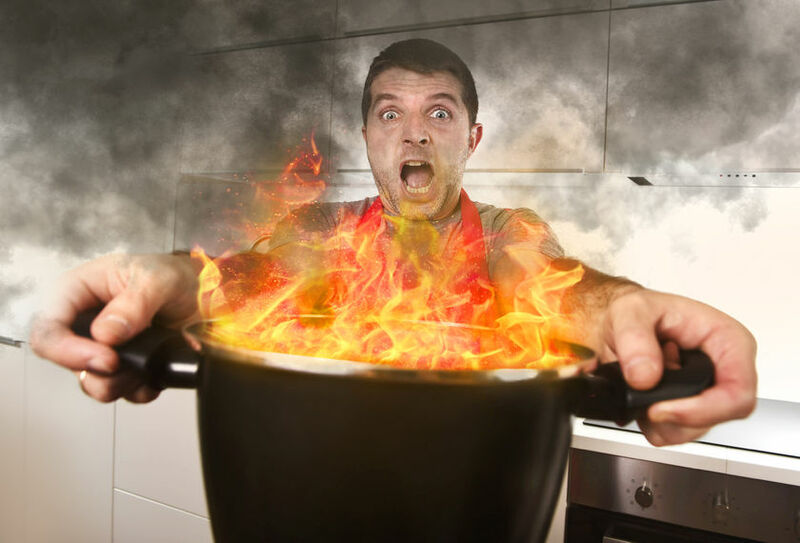 Here are some other common kitchen disasters and how to deal with them. Pots and pans catching fire are not altogether uncommon. However, if you do not deal with it correctly, your peaceful chicken-frying session could end up with your whole kitchen being on fire. When oil is heated up over a fire for too long, smoke will start to appear. Depending on the type of oil, the smoking point can range between 150°C to 230°C. If nothing is done to alleviate the heat at the smoking point, eventually the oil will catch fire. To prevent this from occurring, constantly monitor the oil. Turn down the flame or switch off the gas all together once the oil starts smoking. Of course, there are other ways that oil can catch fire such as during stir-frying. In the event that the oil does catch fire, here are some ways to put it out. If the fire is small, cover the pot or pan with a metal lid. This should prevent oxygen from fueling the flames, which will eventually die down. Pour lots of baking powder or salt into the pan. Do not sprinkle any other substance apart from these two, as it may cause the fire to explode or get worse. Wet a thick and dense cloth and lay it over the pan or pot. Whatever you do, NEVER pour water into the pan in an attempt to put out fire. No matter what your instincts say, this step will likely cause the oil to splash and spread the fire to the rest of your kitchen. If the fire is too big or does not die down using the steps above, call 999 immediately for help. This one is a little simpler to deal with. If you place your dry foods (such as nuts for roasting) or your baking paper too close to the heat source in an oven, there is a possibility of something catching fire in there. To prevent this from happening, make sure you place your foods further away from the heat source, and don’t leave too much of an overhang when using baking paper. Do NOT open the oven door. Immediately turn off your oven. With a limited supply of oxygen in the oven, the fire should die down on its own. Once the fire is out, open the oven and use oven mitts to remove your tray. There will be a lot of smoke, so make sure your windows are open and your room has adequate ventilation. If the fire does not die down after switching off your oven, call 999 immediately for help. Have you ever tried to blend something hot and ended up with food all over your walls? When blending hot foods such as soups, make sure to let the soup cool down a little before putting them in the blender. Hot soup and liquids could cause the blender cap to pop out midway through your blending, leaving you with soup all over your kitchen. Knocking over pots and pans are likely to happen, especially if you’re a natural klutz or are in a particular hurry in cooking. If you are cooking for guests, allow yourself at least double the time it normally takes to prepare your dish, to avoid any unnecessary stress which could potentially lead to a kitchen disaster. While cooking, take measures to make sure the handles of your pots and pans are not sticking out of the kitchen counter area. They should be in parallel with your kitchen counter to reduce the risk of toppling over. Turn off all your gas fires. You don’t want another kitchen disaster to happen while you’re tending to the mess. Allow the spilt contents to cool before cleaning up, to avoid getting scalded. If you have been scalded or burnt by the contents of your pot, immediately run the affected area under cool tap water for 15-20 minutes. Do not use ice water or ice, as that may worsen the damage in some cases. If the wound is severe, head to the nearest hospital immediately.